If you are working on a website with lots of content in custom taxonomies and post types, then you would want to make it easy for your users to find it. One way to do this is by allowing your users to narrow down their search. Previously we showed you how to create a WordPress search form with advance options to choose post type. However, it required adding code to your theme manually. In this article, we will show you how to add an advanced search box in WordPress using Facetious. First thing you need to do is install and activate the Facetious plugin. Upon activation, the plugin adds a Facetious search widget under Appearance » Widgets. Drag and drop Facetious Search widget to your sidebar or any other widgetized area. 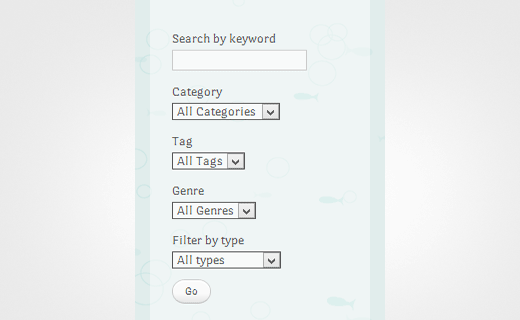 The plugin allows you to choose which taxonomies and post types to include as a field for search criteria. You can even restrict the search to a particular post type such as posts, page, or media. Facetious also uses a custom permalink structure for search results page which allows the plugin to work well with caching plugins like WP Super Cache and W3 Total Cache. While allowing users to select categories, tags, and other options to narrow the search results, this option still uses the built-in WordPress search functionality. Most people would agree in saying that its not the best option. This is why we wrote how to add Google Custom Search in WordPress. 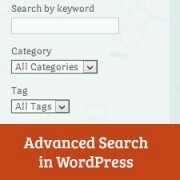 We hope that this article helped you add advanced search options to your WordPress website. For feedback and questions you can find us on Twitter and Facebook or you can leave a comment below. I’m looking to build a smart and detailed product search page – much like ebay, this would let the user pick various categories, filters, sliders, etc. Is there a recommended WP plugin that could do all this using queries on the backend database? Well the WP Google search is not compatible with my version which is 4.4.3 and if Facetious does not give good search results then I am back to square one – no search box. I am now content on not having a search box after the crazy hassle trying to find one. SearchWP wants $49.00 for their plugin. I would not trust purchasing that for the simple reason that the wordpress search widget that came with my site does not function at all and comes about all scrambled. What is it with WordPress and Search Boxes anyway? This forum is most of the time very helpful – but all to often it seems to fall into the category of technical info for the more experienced developers. Experienced developers generally do not need help as they are the ones who can answer questions for the one’s like me. I cannot believe the technical hassle of trying to put a search box on my site – and exactly where I want it. I have a search widget that comes out all messed up. It displays the box with the name “search” halfway in and half out of the box. Then it says “search” again about an inch below it. All together it takes up and creates a 2 1/2″ space besides not displaying properly. When I try search plugins they are dependant on an existing wordpress search box to be installed to begin with. This is one of very many insanely difficult WordPress features that takes something one would think to be simple, and make it as impractical and difficult as one could possibly make. Like a lot of things that I would like to add to my website, I have to do without because all the help forums are explained like one developer to another instead of made simple enough to just install and use. I see the importance of having a search box on my site because it speeds up the searching for a viewer who does not want to dig around for an hour just to find something. But I have given up the idea of ever having one because like a lot of WordPress additions, it is designed for developers to use instead of the less experienced like myself. And I am experienced enough now that I add everything on my site with code instead of visual – a big advantage when building content in WordPress. We would recommend you to check out SearchWP plugin. It is easy enough for beginners and has many advanced features. I cannot afford a developer to do this so I just give up and have to do without. I have spent enough time on this to build about half of a website. 4. Factitious that you wrote there.